Allow you to convert FLAC (Free lossless audio codec)(.flac, .fla, .ogg) to MP3 and WMA, WAV, etc files and easy to use! convert audio files between almost any formats, including MP3, WMA, M4A, AAC, AC3, MP2, WAV, OGG. Magic FLAC to MP3 Converter allows you to convert FLAC files (Free lossless audio codec) (.flac , .fla, .ogg) to MP3 and WMA, WAV files and easy to use! Magic FLAC to MP3 Converter is a powerful FLAC/CUE batch converter ideal for convert FLAC files to MP3 and WMA, WAV files. In addition, you can also use the program to split flac files from CUE files. OJOsoft Audio Converter is an outstanding and professional .FLAC .MP3 converter to convert FLAC files to MP3. 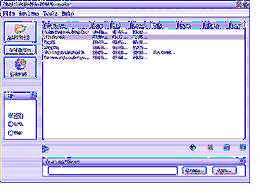 It can convert audio files between almost any formats, including MP3, WMA, M4A, AAC, AC3, MP2, WAV, OGG. Moreover, OJOsoft Audio Converter supports extracting audio tracks from all popular video files, such as AVI, WMV, MP4, MPG, 3GP, DivX, FLV, ASF, VOB, MKV, H.264 etc. 4Musics FLAC to MP3 Converter is a part of 4Musics Multiformat Converter designed only to convert .ogg files to .mp3. With 4musics Multiformat Converter you will have furthermore tool to convert FLAC, WAV, MP3, WMA, OGG, CDA, AAC, M4A, MP2, RA3, AMR_NB, AMR_WB, AC3, AIFF and MMF audio files between each other (total 225 directions), bitrate converters and CD ripper all-in-one + extract audio from video files (WMV, AVI, MPEG1,2, MP4, 3gp, MOV, FLV, SWF, ASF). 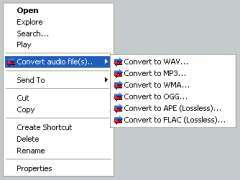 FLAC MP3 Converter converts FLAC to MP3 and keeps ID3 tag. It's an ALL-IN-ONE audio converter that supports more than 90 audio and video files. 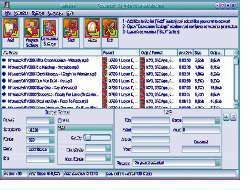 The software is full compatible with Vista. WAV MP3 Converter converts FLAC files to MP3 format easily and quickly. The software also supports more than 90 audio and video files and batch conversion. WAV MP3 Converter has user-friendly-interface and converting your files is just a button click away. You'll be an expert in no time! Other formats all-directions conversions are also supported. FLAC is a lossless audio format, which means it saves original CD quality when you creating FLAC files directly from an audio CD. Unlike WAV format which is also lossless FLAC adds some compression very similar to ZIP shrinking. It doesn't reduce the quality but makes FLAC files smaller than WAV's. They are much bigger than MP3s though, which make it bulky for using in MP3 players and other mobile devices.